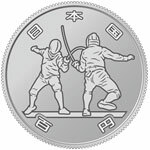 The Ministry of Finance has decided to issue approx. 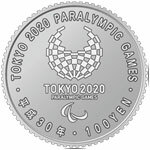 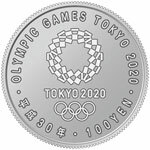 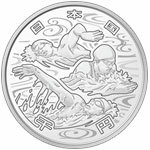 30 types of coins commemorating the Olympic and Paralympic Games Tokyo 2020 in four series before the opening of the Tokyo 2020 Games. 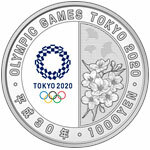 For the first issue, the designs were decided as follows for a 10,000-yen premium-grade gold coin, two types of 1,000-yen premium-grade silver coin, and two types of 100-yen clad coin. 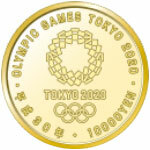 They will be issued as outlined in the Attachment(PDF:58KB) . 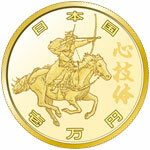 Yabusame (horseback archery) and kanji characters " "
(Note 1) The diameters are 26 mm for the 10,000-yen gold coin, 40 mm for the 1,000-yen silver coins, and 22.6 mm for the 100-yen clad coins. 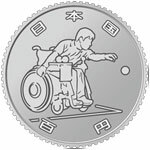 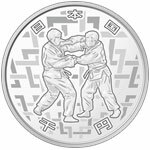 (Note 2) Clad coins refer to the coins with a metal layer sandwiched by the different types of metal plates by using the clad technology. 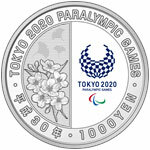 (Note 3) See References 1 to 5(PDF:601KB) for the details of the designs.